Sub-lieutenant Paul Everard serves in the Mediterranean aboard the submarine Ultra, helping the Allies attack Axis supply ships in a life or death struggle beneath the waves. But Paul has other worries: his father, Nick, is somewhere in the Far East, at risk from the rapidly advancing Japanese. His brother, Jack, has become embroiled in the murky world of clandestine operations, and been sent on a high-risk mission to destroy a key German naval base. The Everards are risking everything for the war. But what price is too high for one family to bear? The seventh instalment of the Nicholas Everard Naval Thrillers is a searing adventure of warfare at sea. 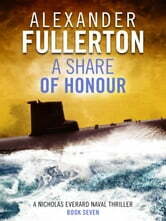 Another spell bound naval fiction. Like other tales by this author, the inter mingling of three characters and plots made for a grand total.